Your website has become the online hub for your business. It’s where your prospects and customers go to learn, research, discover, and vet your business. The design of your website directly reflects the credibility and perception your visitors have about your business. 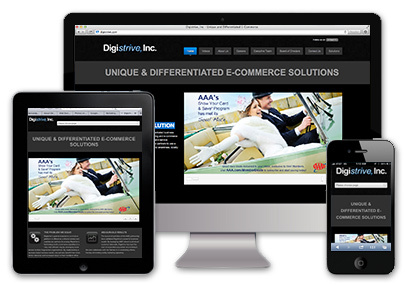 67% of website viewers are more likely to buy a product or service if you have a mobile optimized website. So, when you’re ready to design or redesign your website into an amazing brand experience for your prospects and customers, click the link below and request a free assessment. RESEARCH, STRATEGY, DESIGN & DEVELOPMENT, REVIEW & LAUNCH. Our website design process follows four main stages. Research, strategy, design, development, review, and launch. At every step we are using our expertise and experience to create a superior user experience and memorable interaction with your brand.We work with you to understand your business and your audience. By researching your business and competitors we learn about your business. Our website designs take into account your market and company messaging. We create a solid foundation before we write one line of code. Using established workflows, we create a strategy and creative designs. Designing a website is not just about making it look good. Website need to convert leads and we build websites that accomplish exactly that. We integrate into the business websites we create an effective lead capturing method. How we place call to actions on the website and attract qualified leads is a significantly important to a business website. Every website we design is built with a SEO foundation. This means that the structure of the website and navigation is optimized for not only a superior user experience but also easy indexing by search engines like Google. Each design is completely search engine optimized right from the get go! The websites we design load quickly, look beautiful, and are easy for users to navigate. Social media elements are integrated for optimal sharing and viral possibilities. DCD is a trusted Atlanta website design company with local, national and international clients. If you’re looking for a trusted responsive website design company that can help you achieve your business goals and you’re looking for that special team of Atlanta web developers, that can help your business succeed, contact us today and receive your complementary website design consultation. There’s no better time to make your video production for business work for you. DCD is your trusted resource for inbound marketing, video production, web design and more!